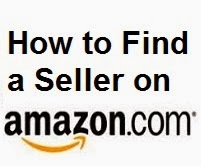 How to Find a Seller on Amazon ? How to Find a Specific Seller ? Enter name of the merchant you want to search in search bar. If the merchant has storefront on amazon than it will show its logo or name in result. If logo do not show that means merchant do not have storefront. How to Find and Unknown Seller ? In search bar enter product name that you want to buy. Click on the "Go" button and you will see list of products. Now choose teh condition "New" or "Old". Now it will show list of sellers of that product.